British Columbia’s seniors population is growing. How we can best care for our elders has never been a more important issue. 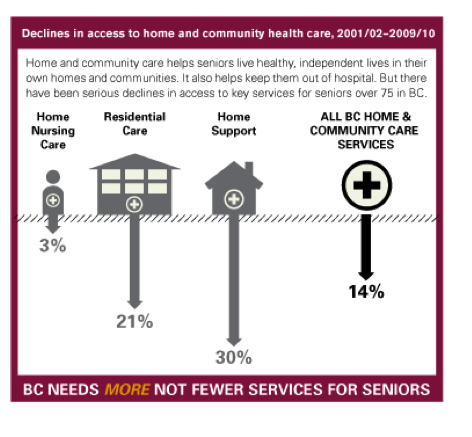 A recent investigation by BC’s Ombudsperson highlights the serious limitations of the home and community care system for BC seniors. A decade of underfunding and restructuring has left the system fragmented, confusing to navigate, and unable to meet seniors’ needs. A more wide-ranging and better-coordinated system of home and community care for seniors can help us move beyond this impasse. It can help seniors to live independent and healthy lives in their own homes and communities. It can reduce pressure on family members to act as caregivers. And it can reduce pressure on hospitals — the most expensive part of our health care system. BC’s population is aging: The number of seniors over age 75 increased by 28 per cent between 2001 and 2010. As shown in the illustration, access to home and community care services for seniors over age 75 dropped between 2001/02 and 2009/10. Seniors have to wait until they are in crisis before they receive the services they require, which often leads to a stay in hospital. Being stuck in hospital can lead to a decline in elderly patients’ mobility and their ability to live independently. The cost of treating a senior in hospital ranges from $825 to $1,968 per day, whereas the cost of residential care is approximately $200 per day. ALC patients are patients who no longer require hospital care but cannot return to their home because residential or home health services are not available. Between 2005/06 and 2010/11, there was a 35.5 per cent increase in the number of ALC hospital beds in BC. By 2011, BC had fallen to the second lowest level of health spending per capita in Canada. This shift is not the result of a more efficient system, but of 10 years of restraint policies. 1. Increase access to home and community care services, especially home support and long-term care. We need investment in greater access to services. Not only do these services need to keep up with future growth in the seniors population, but we need to increase their availability in the short term as well. QUESTION FOR CANDIDATE What investments would your government make in home and long-term care services to prepare for future growth in the seniors population? 2. Integrate home and community care and primary care (physician) services for seniors with complex health needs. It is a challenge for these seniors to live well at home given the current fragmentation in service delivery and limited hours of care. Many of the basic home support services seniors need — like transportation and assistance shopping or preparing meals — are no longer publicly provided. QUESTION FOR CANDIDATE: How would your government integrate seniors' services so that interdisciplinary medical care as well as non-medical support services are publicly funded and organized to meet the needs of seniors in the community? 3. Increase patient involvement in decisions about their care. Evidence shows that when we redesign services around the needs of the patient rather than the provider, both the quality and cost-effectiveness of care are improved. When individual patients with complex chronic conditions are empowered to manage their care, their health improves and they use fewer hospital and physician services. For example, American transition coaches help older patients effectively communicate with health care professionals and manage their illnesses as they leave the hospital. Research shows this care helps reduce hospital readmission rates. QUESTION FOR CANDIDATE: Would your government take leadership to ensure the health authorities expand successful programs already running in the province that promote a greater role for patients in managing their care? How will you make these programs more accessible to low-income, rural and immigrant seniors? Seniors remain independent and healthy by building self-esteem and coping skills, increasing knowledge of available health and community resources, and engaging in health-promoting behaviours. QUESTION FOR CANDIDATE: Would your government significantly increase funding for non-medical home support and transportation services for seniors? 5. Improve public reporting on key indicators to increase accountability and health system improvement. The need for more transparent, accessible reporting on home and community care services, funding levels and health outcomes was highlighted by the province’s Ombudsperson in her recent investigation. Consistent, publicly available data on Alternate Level of Care patients, hospital occupancy rates, and hospital utilization by people with limited incomes and few social supports are needed. QUESTION FOR CANDIDATE: Would your government implement all of the BC Ombudsperson’s recommendations related to reporting and accountability in seniors' care?